I've loved The Pioneer Woman for as long as I've known blogs existed. I especially love her cooking site, which is always chock-full of butter, cream, sugar, oil, and all the things that make food taste good. The amounts of these ingredients in her food are perfect for salivating over from afar (especially with her amazing, detailed step-by-step photos), but I had never actually made one of her recipes until yesterday. 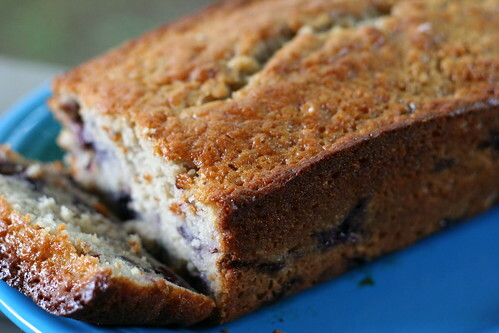 This blueberry yogurt pound cake is more like a zucchini or banana bread than a pound cake (although I don't know the technical difference), and feels relatively "healthy" due to its conspicuous lack of butter. That is, of course, if you ignore the copious amounts of sugar. I brought it to work this morning and it disappeared pretty quickly. This one's definitely a keeper! Sift together the flour, baking powder, and salt. Set aside. In a separate bowl, mix together yogurt, sugar, eggs, vanilla, and oil until just combined. Pour over dry ingredients and mix until just combined. Gently stir in 1 cup blueberries. Do not overbeat. Pour into a loaf pan and bake for 60-70 minutes, or until a tester comes out clean. Remove from oven and allow to cool. I have been thinking of making strawberry pound cake...This looks wonderful. This cake looks really good. I love pound cake. Gotta try this yoghurt version. Is yogurt a wonder food or what? Whenever we run out of buttermilk for pancakes-from-scratch, I substitute smooth yogurt (usually strawberry) and it works amazingly well! This bread looks just delicious. I love yogurt cakes. Can't wait to try this one! Thanks! This looks like the perfect breakfast bread to make my mom when she comes to visit!! Yum!